Listening to the work of my favourite species….. | Which me am I today? Listening to the work of my favourite species….. Yesterday I trundled to see my favourite species – students at Bradford University. 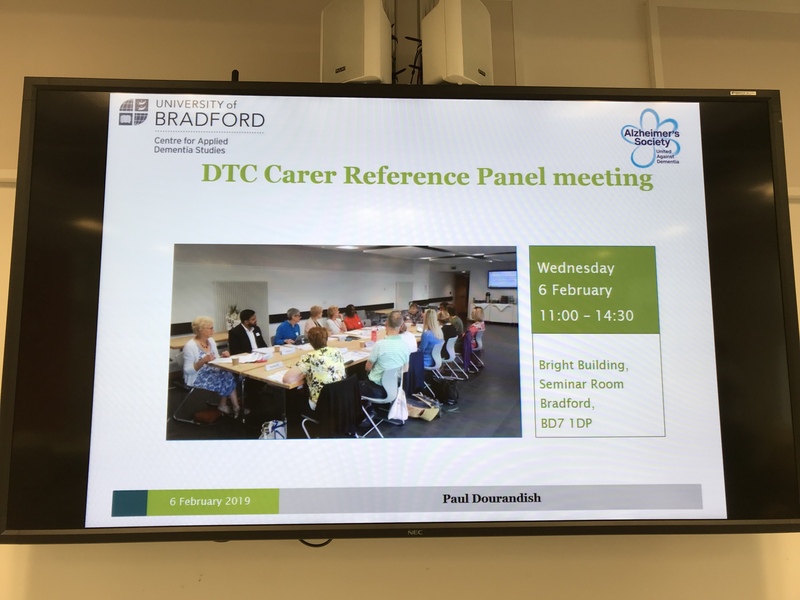 This time I was there as an Alzheimers Society Research Network monitor for the DCT (can’t remember what DCT stands for – hate acronyms 🙄)………. Anyway some of the PhD students were there to give us an update and presentation of their work so far. Anyway the trains behaved in the beginning and I’m typing this on the second train to Leeds. Barbara started the meeting and we introduced ourselves. Students, Helen, Angela Suzanne and Paul were the ones under the spotlight today. We celebrated Courtney’s and Denise passing of their PhD – amazing………both were sadly not there as they’re now working! Murna then spoke about a possible celebration and dissemination event in July to celebrate their graduation. In the literature there is little in relation to medicines management particularly of those living alone….. 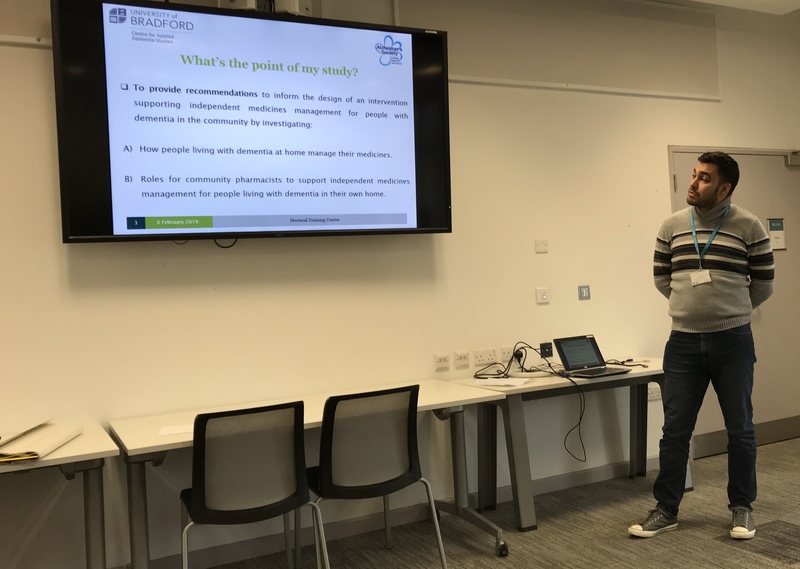 So this formed the basis for the questions for his project…..he will be gathering information from people with dementia on attitudes, challenges, routines and strategies, Types of support and what would help…….. Sometimes it’s the simple things that help……for example medication in liquid form than tablets. 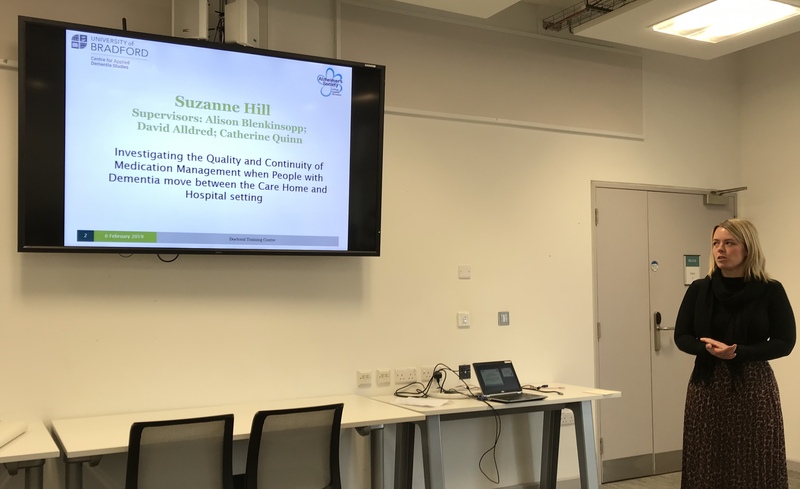 I mentioned the importance of colour – if I needed 1 familiar pink one, that stood out, then giving me 2 white ones won’t help…..
Suzanne was up next……her study is on investigation the quality of medication management when moving from care home to hospital and back again. It will hopefully inform improvement into the practice and influence policy. She’s looking at policies in the hospital and care home – their roles and responsibilities at transition points between the 2 establishments. 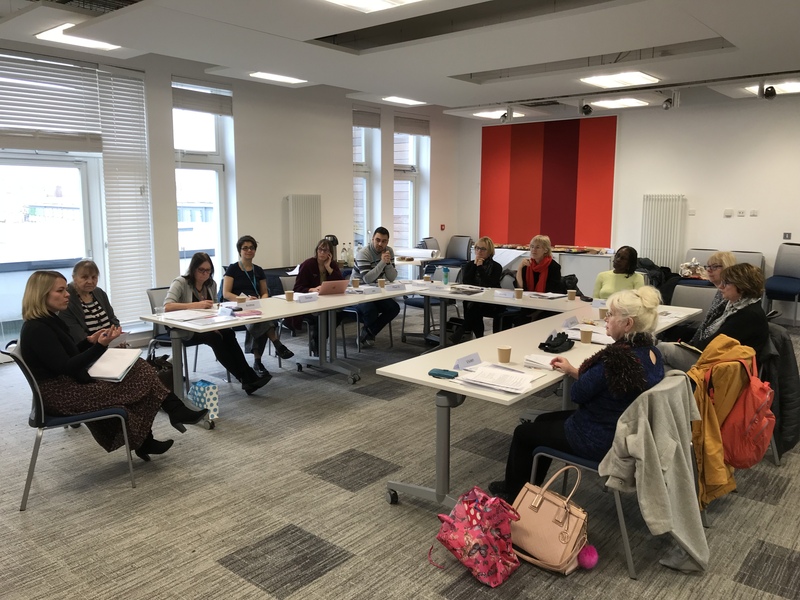 The question was raised around responsibility when someone with dementia is admitted to hospital – should someone from the care home go with them? But is that practical if the person maybe in A&E for 10 hours or something. Who is accountable for information transfer? It’s the tiny detail that makes the difference between someone taking medication and someone not. It’s not just a list of drugs that’s needed, it’s the finer detail about the person themselves that’s useful to know. Third up after lunch was Angela who is looking at the nurses role in transition between hospital and care home paying particular interest in the discharge process. Her main questions are around roles and responsibility and the barriers and facilitators for implementing these roles. 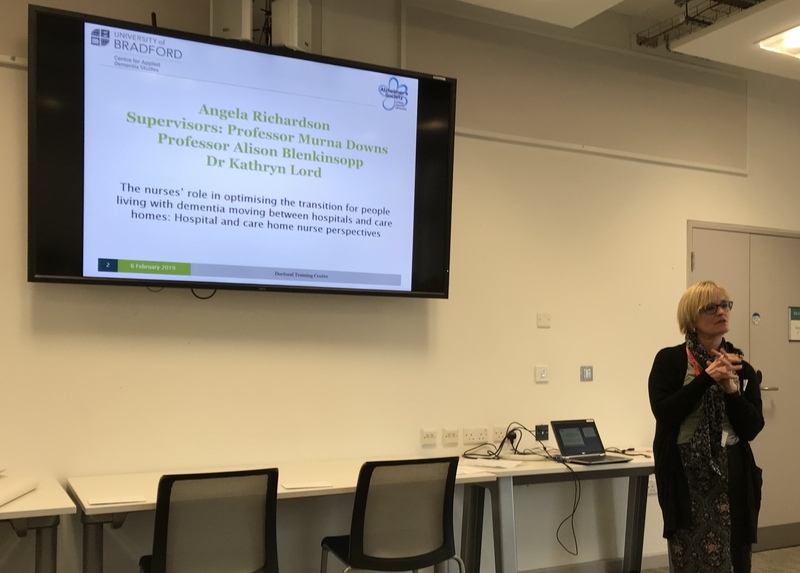 She is gathering both perspectives from nurses and care home staff about what is their role when someone with dementia is being discharged back to the care home. She found a lot of variation in practice around information exchange. Lots of tensions within the system. The one side don’t understand the others practices … there’s no joined up working sadly. IT systems don’t talk to one another which are big barriers to helping good practice. I said how hospital managers and Care home managers and Pharmacists, need to be invited to hear the outcomes of all these projects. They need to be made to look silly as they won’t believe the staff on the ground have the problems they have. No good having the staff as they can’t make the change but managers should be made accountable for such rubbish and disjointed systems. They should have a job swap for a day…..hospital nurses have very little knowledge of what goes on in a care home. They don’t see how they are all one big team. There’s a cultural issue of how care homes are viewed. Finally Helen gave us an update about her project. Talking to women who lived on their own when diagnosed but not necessarily now. She is doing it through narrative research, so gaining valuable information through conversations. However, she found it so difficult to gain interviews because, she thought, of racism and gatekeepers. It’s about people attitudes and assumptions. Dementia has silenced a lot of people as gatekeeping comes into play. The mental capacity act is being used to stop people doing things instead of enabling. She has only been able to get women through word of mouth. No other method has worked for her. From all I heard there was soooo many examples of why I never want to go in a care home…..or into hospital………. 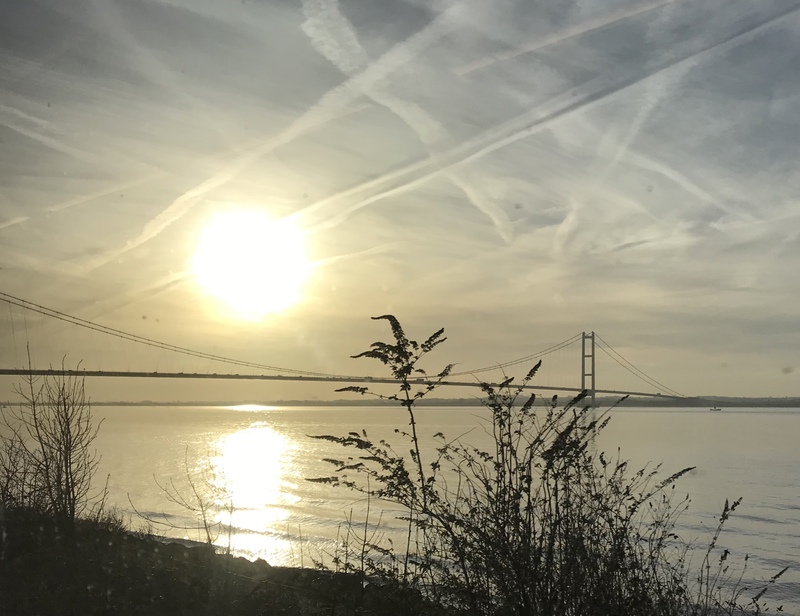 At the end me, Sandra and Viv met with Prof Jan and Prof Murna to discuss the meeting from the perspective of the Alzheimers society research network monitors……..just so we could complete our feedback form. Needless to say we were well impressed as we always are here at Bradford. Seeing the students eyes light up when they speak with such enthusiasm is a joy……….wonderful….. I use NOMADS which, as long as I remember how many are in the blister pack, are good. As for staff from Homes at hospital, my experience was when I worked in Independent Living staff stayed 24/7 at hospital. Nightmare for Rotas!, probably stopped now due to cost. For the first time on your BLOG. I am Dutch and i am reading your book in Dutch, because a friend of mine is diagnosed with Alzheimer. She is 63. I am impressed bij your book. It so good that you are open about it. In the Netherlands there is a similair organisation that you are with, but here is not much kwoledge about Youg Alzheimer too. I saw the film Still Alce two times. I eenjoy your book. Many blessings. Wanda Simmermans. I really enjoyed your post today Wendy. Interesting to hear about the phd students. My daughter Laura ( who introduced me to your blog) is a PhD student at Newcastle uni. She thought I might be interested in Billy as a cat lover and also because my dad at 83 is starting with dementia. Laura incidentally was a RA then did a Masters now PHD in dementia studies. Lovely to have seen you yesterday in York and the day before at the University of Bradford..
Our group is so close and so harmonious. Good to see Viv, Sue and Geoff. I so like it that you have described us as the A team. I too dislike acronyms; especially when there is no explanation of their meaning. Barbara with all good wishes. I’m certain (because sometimes human beings can be real arseholes) that some people may assert that in some way you haven’t really got “proper” dementia if you are still lucid enough to do all this marvellous writing and addressing others at meetings etc. I’m happy to dismiss such challenges or criticisms as vexatious, but more than that, I am so happy that someone with this condition is still able to speak up and get listened to by those who need to hear. I’m just happy that there’s someone to speak up for those who can no longer do it for themself. Thank you Wendy.